The Bay Area is home to stately mountains and forests, major metropolitan centers, sprawling suburbs, and an impressive nexus of roads, rail lines, bridges, and tunnels, but our region is named for the estuary that provides its contours. As Will Travis, former Executive Director of the San Francisco Bay Conservation and Development Commission, puts it, “The bay is our Eiffel Tower, our El Capitan, our Big Ben. It is a visual icon which gives our region its identity as a place different from everywhere else.” Over 7 million of us live near the bays, rivers, and creeks that comprise the San Francisco Bay watershed, but relatively few of us interact with it on a daily basis or know much about its history or ecology. 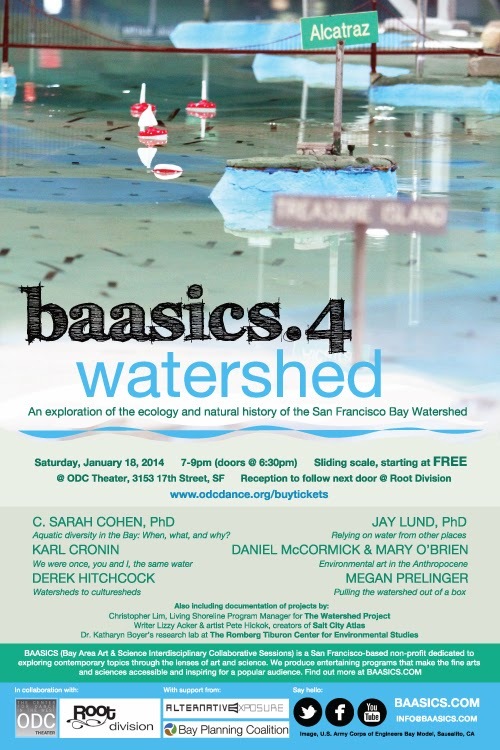 BAASICS.4: Watershed brings together a diverse group of artists and scientists to reflect on the San Francisco Bay Area watershed. Professor Jay Lund will highlight and explore the ramifications of the urban Bay Area’s dependence on water from distant sources; environmental artists Daniel McCormick and Mary O’Brien will discuss what they term “remedial art,” surveying some of their Watershed Sculpture projects; Professor Sarah Cohen will introduce us to “sea vomit” and other species as she spotlights aquatic diversity in the Bay; accompanied by a string quartet, Karl Cronin, Music Director of the Americana Orchestra, will guide us through a poetic meditation on our relationship to the Hetch Hetchy Valley. These participants and others will join BAASICS co-founders and producers Selene Foster and Christopher Reiger for a entertaining and meandering exploration of the ecology and natural history of our region’s namesake and the tributaries that flow into it. Immediately following the ODC Theater program, a reception will be held next door, at Root Division, an arts and arts education non-profit. Join us for drinks, good conversation, and networking. Sarah Cohen, PhD – Aquatic diversity in the Bay: When, what, and why? BAASICS (Bay Area Art & Science Interdisciplinary Collaborative Sessions) is a San Francisco-based non-profit organization dedicated to exploring contemporary topics through the lenses of art and science. We produce free and entertaining programs that make the contemporary fine arts and sciences accessible and inspiring for a popular audience. Additionally, we aim to foment interdisciplinary exchange and a new genre of experimentation that will move beyond what one of these disciplines can achieve on its own. BAASICS is a charitable, tax-exempt, 501(c)(3) organization. Our programming is made possible through public support, corporate sponsorships, and funds from Southern Exposure’s Alternative Exposure Grant Program. 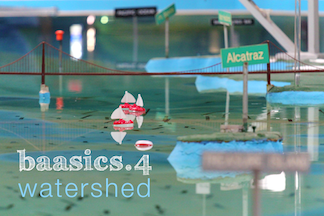 BAASICS.4: Watershed was produced in conjunction with ODC Theater and Root Division, with support from The Bay Planning Coalition.